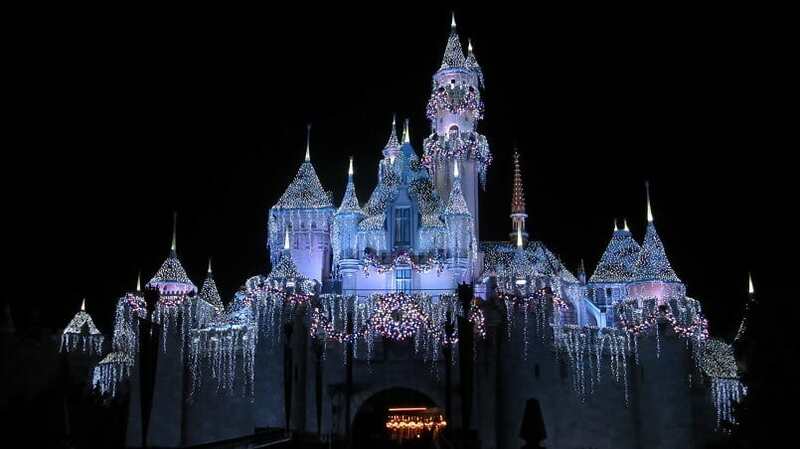 when it’s the holidays at disneyland, it grows even more magical. aside from the special decorations and fireworks and parades, and the seasonal food offerings, it was the first time i’ve never sweated all day, wanting to retreat somewhere cool and dark and quiet at 3pm. i couldn’t stop saying, IT’S SO BEAUTIFUL and IT’S LIT (after which i would roll my eyes at myself even though it was not intentional). so i’m posting about it because 1) procrastination (finals next week! finding motivation is like playing where’s waldo) and 2) you should go if you can within the next 5 weeks. side note: if you’re curious about how i go to disneyland so much, it’s because i go for free. i’m fortunate to have a friend who works for disney, and she takes me in for free (don’t worry, she uses me too and brings friends over to crash at my apartment) sometimes. and if you volunteer at disney marathons, you can get free 1 day 1 park tickets. used to be park-hoppers though; WHY DISNEY WHY. 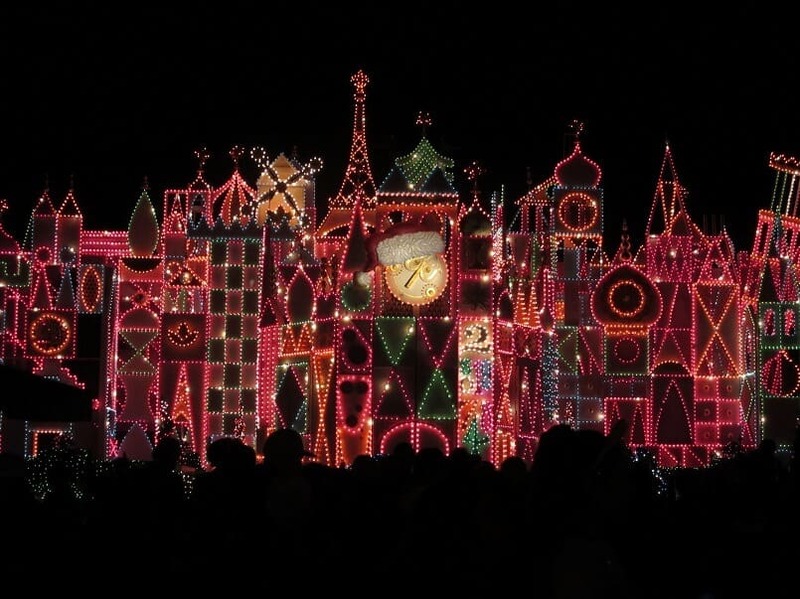 not everything i’m going to talk about is seasonal despite this being called a holidays at disneyland post, but where else would i write about these things if not in this post? seasonal things are marked by 🎄. would also like to mention that this is a safe space; i know there’s a lot of food going on for one day, but i would like to mention that there were others involved in the gluttony, not only me. and my sleepy friend (who was sleepy even before we got to the park sigh) was energized solely by creepy rides (pinnochio’s daring journey, i’m looking at you), more carbs, and bright lights, so regular food injections were critical. 🎄 decorations: my favorites appeared at night, when the lights came on. it’s a small world is decked out in red, and even the inside of the ride gets fancified (though the outside is much more awe-inspiring). also: “is that the raj mahal?” nope, friend, not quite. are we actually educated? the castle is also wonderful, but only at certain times. there are 3 sets of lights: a purple/pink, blue, and white. the white only comes on when a disembodied voice on the pa system announces that the castle light show is starting (it seemed to be at a random time), and right after the fireworks. hard to catch, but my favorite light set of the trio. pro tip: if you want a castle picture with no one else in the picture, walk by between the first night parade and the fireworks, since they rope off the area. the employees will probably tell you to stop taking pictures and keep moving, but there’s bound to be a traffic jam anyways, and then you can shuffle your way through with your camera lifted up. hyperspace mountain, aka space mountain, star wars edition: it was so much faster than i remembered it being, and was still ahhhmazing the second time we rode it. corn dog: there’s a corn dog cart between the end of the right side of main st and the plaza inn. they’re super fresh and you can see them come out of the fryer and get handed to you hot. they’re $7 each (ouch…), but the cornbread is tender on the inside, slightly sweet, and oh so crispy on the outside. my friend couldn’t stop talking about the hot link corn dog in california adventure, but we didn’t try that one this time because our tickets were only good for 1 park. NEXT TIME. 🎄 peppermint beignets: mickey shaped beignets, dusted in peppermint, from mint julep bar. they’re minty without being too intense (see: the peppermint dusted waffle cone), and way too easy to keep eating. the dough isn’t as light as can be, but that just means i need to go to new orleans asap (see also: the shrimp po’boy). pro tip: the ones in the park are mickey shaped, but the ones in downtown aren’t, and i’m not sure if they have the peppermint ones or only the originals. moana: can i sneak this in? technically not disneyland related, even though moana is now available for meet and greets at california adventure. also will be listening to “how far i’ll go” non-stop this week. shrimp po’boy: from the french market in new orleans square. the combo of fresh veggies, crunchy shrimp and creamy mayo can’t be beat. the shrimp were cooked well (not overcooked yayayayay), though the coating was less crunchy than i would have liked. will get on planning that nola trip right NOW. cheddar garlic bagel twist: cheddar filled bread dusted with poppy seeds from maurice’s treats in fantasy faire (an offshoot from the central core between frontierland and the castle). i wanted the cheese just a little bit hotter and more melty, and couldn’t help but think that a pot of warm garlic butter to dip it into would make it better. this was my friend’s favorite thing we ate that day though. 🎄 chocolate yule log: chocolate cake with coffee buttercream and chestnuts from the plaza inn. the cake was a little on the dry side; maybe this was because we got it at the end of the night? but the flavor was still delicious, and the coffee buttercream was reminiscent of coffee ice cream. the chestnuts were unexpected (nowhere during my holiday food research did it mention that this buche de noel had chestnuts), so my friend was a bit freaked out and thought it wasn’t something edible. and when i finally tried it, i thought it was a japanese sweet potato at first lol. there were also crunchy balls (if you come up with a better term, i’m all dumbo ears) that i almost want to liken to the tiny rice balls in furikake, though i guess it’s also similar to a crunch bar. 🎄 haunted mansion: it’s normally the haunted mansion themed, as one might expect. during halloween and christmas, however, it turns into a tribute to the nightmare before christmas. it’s probably the biggest in-ride change within the park. it’s cool, but would definitely recommend fastpasses. we got on the ride in <15 minutes, and i doubt i would have found it worthwhile had i waited in the standby line. 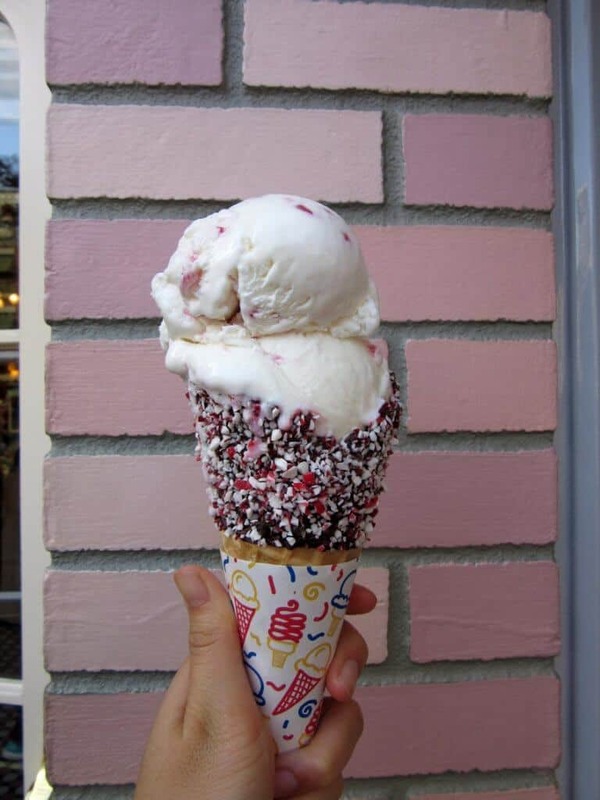 🎄 peppermint ice cream in a chocolate dipped, peppermint coated waffle cone: the ice cream was lightly minty and creamy as can be. the cone was definitely more for the aesthetic than the taste; it was so minty that it made the ice cream taste like plain vanilla in comparison, and my friend refused to take more than 2 bites. was 2 scoops of dreyer’s peppermint ice cream and a pretty but too minty cone worth $6? i don’t think so. cream cheese-filled pretzel: from a cart near star tours in tomorrowland. the cream cheese was yummy, but i found the pretzel to be hard and dense. my friend thought that salt in the pretzel dough was much needed, though i think some cinnamon or cinnamon sugar would have been nice. 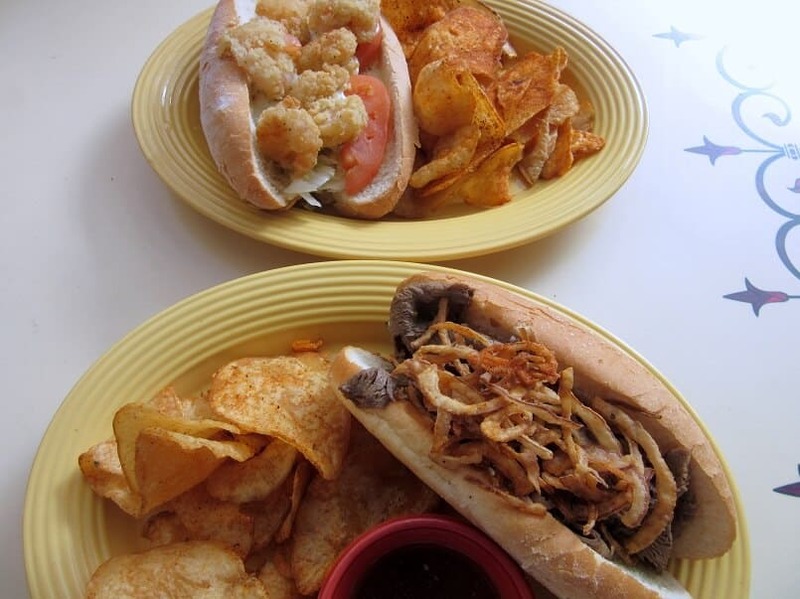 french dip: roast beef filled sandwich with fried onions on top and jus on the side from the french market in new orleans square. it was a bit bland, but that might have been because i forwent the horseradish. best eaten immediately, or else the bread becomes mushy and gross. 🎄 jingle cruise: of the christmas decorations, this was the weakest offering i saw. it seemed like the decorations were just strewn everywhere with no regard to actually decorating. and it was most certainly not worth the 45 minute wait, which probably was the longest queue we stood in all day. so, holidays at disneyland? yes. highly recommend. and even better if you get a park hopper and go on tower of terror before it closes down to get re-themed a la guardians of the galaxy. highly recommend going during the holidays (: that is one of the downfalls of going so often; i don’t wet my pants when i go anymore (that might be a good thing haha), and though i still enjoy going, it’s not as WHOA as it used to be. YES! I love this! We just visited DIsney World with my little lady and the frozen castle was THE BEST. hope you guys had an amazing time!! i saw so many kids (shocking, i know) and a lot of them seemed like they were not having it, lol. perfect way to celebrate after finals, maybe? (; though i bet the crowds are going to be crazy.